Chinese Baimiao is a line drawing in traditional ink and brush style. Therefore, it is called a linear art. Chinese Baimiao is painted with lines by Chinese ink. It is simple, summarized, clear and without Color. Every line should be seen clear, even though a piece of hair must be expressed clearly. There are at least 18 kinds of lines to be used in Chinese Baimiao. During we paint a Baimiao, the most important is that we must be responsible to every line and write it out as similar as we write Chinese calligraphy. Every line must go through the process of beginning, going on and stopping, just as we write every stroke in Chinese calligraphy. Baimiao is one of the steps of Chinese Gongbi painting. If we color it, it will become a Chinese Gongbi; otherwise, it can also be an independent art style. 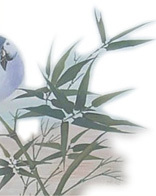 Because line is the bone of the Chinese painting, every student who learns Chinese painting must learn Baimiao. Now I would like to show you some of my Baimiao assignments in Chinese National Academy of Arts(2011 to 2015) and China Central Academy of Fine Arts (2010 to 2011)as a full time student with you and I do hope they will bring you a basic impression on Chinese Baimiao. If you have any questions, comments and suggestions, please write to shirley@ebridge.cn or publish your opinions in Forum For Friends. You are welcomed.